Innovative Housing, Inc. - What's New at IHI! - What's New at IHI? Home » What's New » What's New at IHI? IHI is pleased to announce that the City of Portland has awarded nearly $6M to help modernize and rehabilitate the Garden Park Apartments, and to create 62 new affordable homes on the property. IHI acquired Garden Park in late 2017. It currently offers 63 two-bedroom apartments, but the site is underutilized. IHI plans to renovate 33 of the units, replace 29, and create 62 brand new apartments ranging from studios to three-bedrooms. The project is not yet fully funded, but the City's commitment is a great step forward! See the City's press release below or download the Release as a PDF file. Congratulations to IHI's long-time Board President, Joseph Hughes, who has been named an Icon of Portland's building industry by the Daily Journal of Commerce. Joe and other honorees were celebrated at the DJC's Phenoms & Icons event on December 12, 2018. These awards were created to recognize the local building industry's leaders and up-and-coming professional who are shaping the construction, architecture, engineering, and related industries in our region. In addition to leading IHI's board, Joe is the President and Owner of Joseph Hughes Construction, which has been providing general contractor services to the greater Northwest since 1981. You can read more about Joe and the other Phenoms & Icons of 2018 here. On November 14th the Portland City Council appointed Sarah Stevenson to Portland's Housing Advisory Commission (PHAC). She was officially sworn in on December 4, 2018, joining the Commission designated as the primary public forum for discussion of housing policy, strategy, and resources in the City of Portland. provide a forum for public input on housing and homelessness issues. To learn more about PHAC and access meeting minutes and other materials, please visit the Portland Housing Bureau's website at https://www.portlandoregon.gov/phb/74054. In November, 2018, IHI's management team at Income Property Management will begin preleasing 93 units of affordable housing at Vibrant! Interested parties should contact IPM at: vibrantleasing@ipmco.com to get on a list to be notified when pre-applications are available. 40 apartments at Vibrant! will be set aside for Homeless Families. If you are homeless and in need of housing, please call the Mobile Housing team by dialing 211. Unveiling our new building's name: Vibrant! On June 14, 2018 Innovative Housing Inc. celebrated the completion of the top floor of its newest family housing project in the Pearl District of NW Portland. To mark the occasion, IHI hosted a Topping Out Party where guests enjoyed food, drinks, and toured the building still under construction. Special guests included students in Ms. Tracy's second grade class at Beverly Cleary School, who studied the building as part of an affordable housing development lesson with IHI's Executive Director Sarah Stevenson. 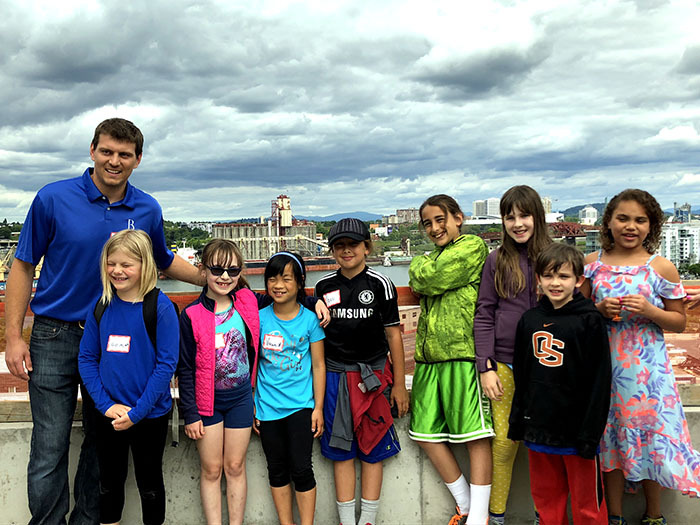 Bremik Construction project manager Damien Koehler lead the students on a special tour, including a visit to the 12th floor rooftop deck. IHI waited until the celebration to unveil the building's name - Vibrant! This name was selected to reflect the building's design and intent. When Vibrant! 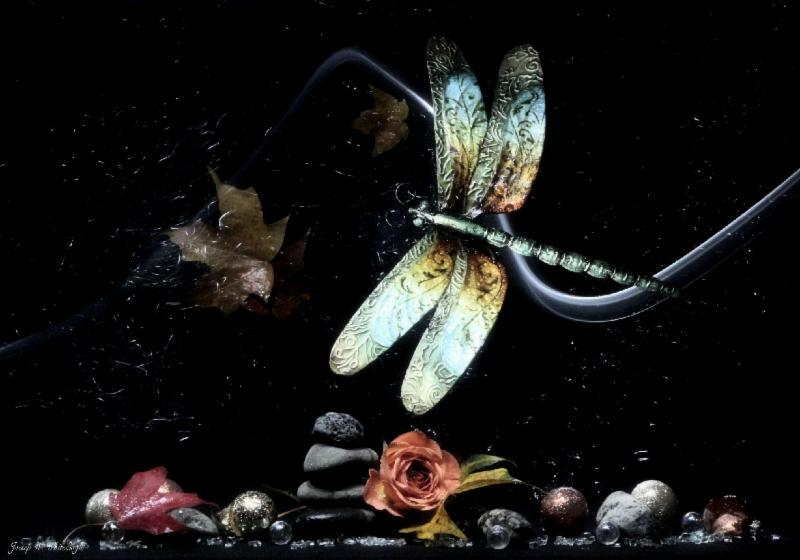 is full of new residents, it will pulsate with life and vibrancy as families create homes for themselves. With its iconic, orange rotated bays Vibrant! 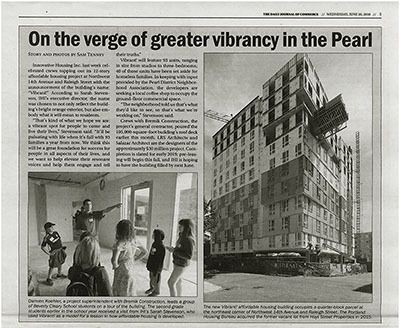 will bring new energy to the Pearl's architectural landscape. 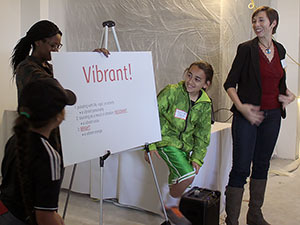 Vibrant is also defined as resonant, and IHI's hopes are that this new space will elevate and help our residents' voices resonate as they tell their own stories here. Vibrant! will be home to 93 affordable apartment homes on 12 floors - most are 2 and 3 bedrooms. 40 of the large apartments have rent subsidies and will be set aside for homeless families. The project will be complete in February 2019 and preleasing will begin this fall, with rents ranging from $350-$775 for a one-bedroom, $422-$932 for a two-bedroom, and $487-$1,022 for a three-bedroom. Please click the images to see a larger version. 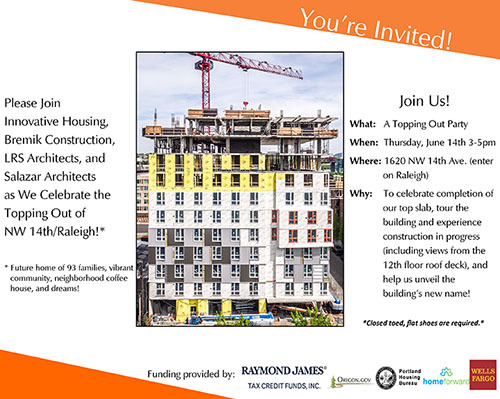 Why: To celebrate completion of our top slab, tour the building and experience construction in progress (including views from the 12th floor roof deck), and help us unveil the building's new name! Repulsing the Monkey is a story about a brother and sister who have inherited their parents' bar in a blue-collar neighborhood in Pittsburgh, Pennsylvania. The area is becoming gentrified and they struggle with the question: Should they sell, or should they keep their family and neighborhood's heritage alive? Repulsing the Monkey tackles the conflicts and heartbreak that one family faces when profit is placed above all. This play premiered in Pittsburgh and enjoyed a successful run in San Diego. 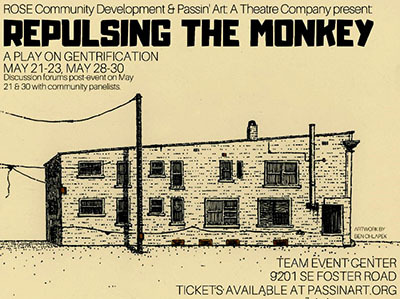 Now, thanks to Rose Community Development and PassinArt, it is coming to Portland for six nights in May (May 21-23 and 28-30 at 7pm nightly) at the T.E.A.M. Event Center located at 9201 SE Foster Road in Portland. Repulsing the Monkey is directed by Jamie M Rae featuring local artists. 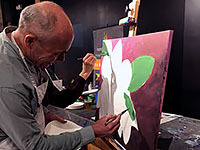 For tickets please visit PassinArt's website, call (503) 235-8079, or contact ROSE Community Development at info@rosecdc.org. Tickets are $5.00-$15.00 on a sliding scale. Seating is limited, advance purchase of tickets is recommended. We look forward to sharing a creative new way to reflect on the complexities and challenges of gentrification and displacement, both of which are having significant impacts on Portland. Innovative Housing Inc. is mid-way through construction of our newest affordable housing development - a 12-story, 93-unit family housing project in the Pearl Neighborhood of NW Portland. The Daily Journal of Commerce (DJC) included a great write up and photo spread of our contractors, Bremik Construction, pouring the 9th floor concrete. The DJC is an Oregon newspaper dedicated to building and construction news in Portland, Oregon and the Pacific Northwest. Check out the link to their online write-up and construction in progress photos below! 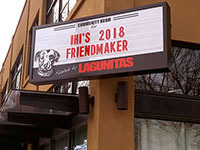 IHI's 2018 FriendMaker Was Great, Thanks To You! Our 2018 FriendMaker was a blast! Thank you to all who joined us, as well as to our sponsors for their continued support. Thanks to their generosity, we were able to raise over $72,000 for our Resident Services program this year. The view in the reception area of the Hotel Merwyn. 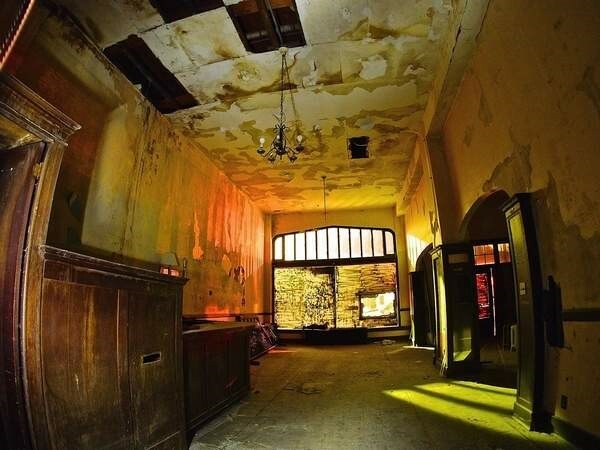 For the past 30 years, the historic Hotel Merwyn (also known as the Waldorf Hotel) has been in desperate need of restoration. On Tuesday, January 9, 2018, the Astoria Planning Commission unanimously approved a conditional use permit for Innovative Housing, Inc. to turn the Merwyn into 40 affordable workforce housing units with retail space on the bottom floor. The City's approval allows IHI to apply for State funds this spring to complete an historic renovation of the vacant and neglected hotel. IHI currently has the property under contract and will acquire it later this year. The historic building was built in 1926 by an Astoria businessman and is considered one of the best surviving examples of Late Commercial architectural style with Renaissance detailing in Astoria today. Read more about the Astoria Planning Commission's decision in this article. 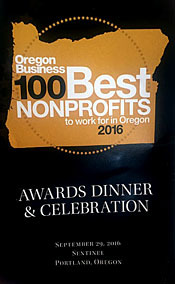 On September 29th, the state's top nonprofits gathered at the Sentinel Hotel for Oregon Business Magazine's annual announcement of the 100 Best Nonprofits to Work for in Oregon. For the fourth consecutive year IHI is honored to be named one of the top 100. Categorized by large, medium, and small nonprofits, IHI ranked #19 in the small organizations list. The list relies on employee surveys rating their satisfaction with work environment, mission and goals, career development and learning, benefits and compensation, and management and communications. Here's a full list of the 2017 Best Nonprofits to Work for in Oregon. Cold weather is just around the corner and we need to make sure every child living in our housing has a coat to keep them warm. You can make a difference! Please join our 11th Annual Coats for Kids Campaign. 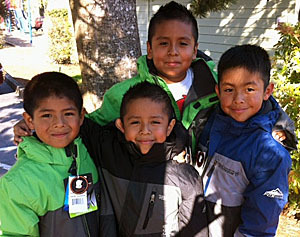 With your support, we have distributed more than 1,000 coats to low-income children over the last 10 years! Many of our resident families have difficulty meeting basic needs like food and clothing year-round. These hardships increase in fall and winter as parents face higher utility bills and children need heavier clothing. For some families, warm coats are a luxury that they cannot afford. Eleven years ago a resident contacted IHI to report that her neighbor's children were walking to school in the dead of winter without coats. 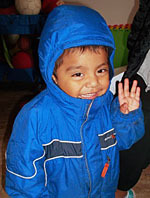 We soon discovered that many children living at our properties were in need of warm coats. IHI secured a donation to buy winter jackets for those children - and Coats for Kids was born! 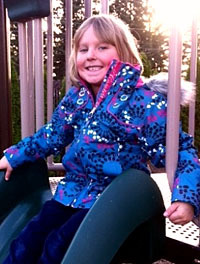 Thanks to donors like you, IHI ensures that no child living in our housing goes without a winter coat. Will you donate to help all of our resident children stay warm and healthy this winter? As always, Innovative Housing will bear the overhead costs of our services, which means that 100% of your donation will directly benefit children in need. If you have questions or would like additional information, please contact Brittini Allen, IHI's Director of Fundraising and Communications, at (503) 226-4368, x1 or ballen@innovativehousinginc.com. Blind Coffee Roasters, a local Portland company, has crafted a unique coffee blend just for IHI! Dubbed the "Home" Brew, it is a specialty blend of smooth, rich coffee with distinctive flavors of sweet caramel, mixed roasted nuts, and milk chocolate. $5 of every pound sold will be donated to IHI. You can purchase The Home Brew here! 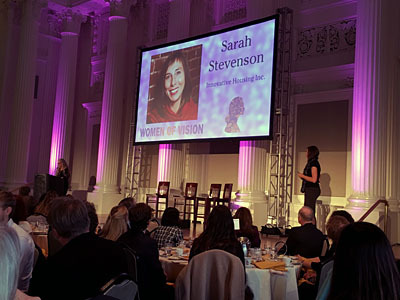 On October 26, 2016 Sarah Stevenson, IHI's Executive Director, graciously accepted the Daily Journal of Commerce's 2016 Women of Vision award. Sarah is one of 36 women who received the award this year. 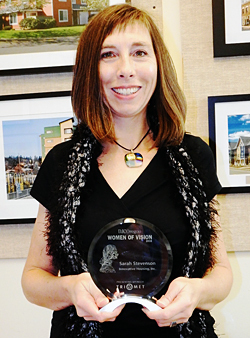 The award recognizes women shaping the built environment in Oregon and Southwest Washington through their leadership, mentoring efforts, community involvement and promotion of industry diversity. You can read more about the awards and the list of those recognized here. On Thursday, September 15th, Innovative Housing, Inc. unveiled the first in a groundbreaking series of sound art installations designed to help bring the history of Old Town to life. Guests gathered to celebrate Old Town's newest attraction, created by historian Jacqueline Peterson-Loomis and sound recordist Larry Johnson, and produced in collaboration with Charles Morrow of Charles Morrow Sound, Inc. The first soundscape evokes August Erickson's Workingman's Saloon between 1890 and 1916. It is located on NW 2nd Avenue between Burnside and Couch, in front of the Erickson Fritz Apartments. For the first 15 minutes of each hour, those who pass by on the sidewalk will find themselves enveloped in the sound bubble of another era. Soon to come will be soundscapes that tell the story of the Greek community in Old Town circa 1925-1960, the Jewish immigrant experience from 1925-1960, and the Japanese American experience from 1915-1941. Each soundscape will be installed on an historic building within a 3-block radius so that visitors can easily enjoy a self-guided tour through Old Town's past. The Old Town Soundscape Project is generously funded by the Portland Development Commission and the Oregon Cultural Trust. 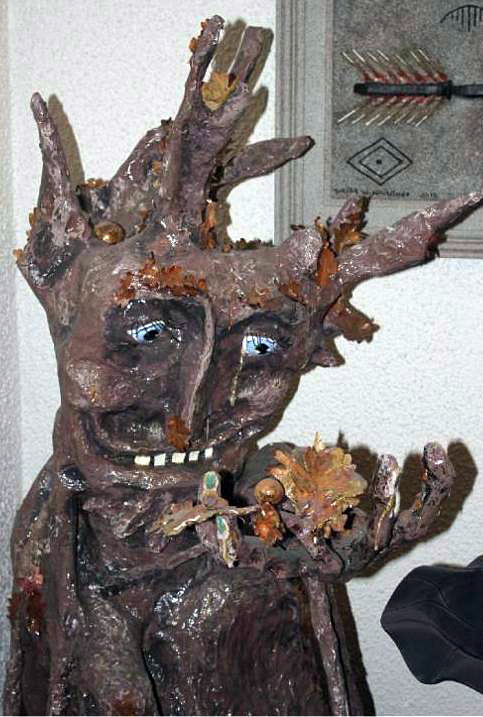 To learn more about the project, read this Portland Tribune article. You can also follow us on Facebook to receive updates on the other sound art installation openings. 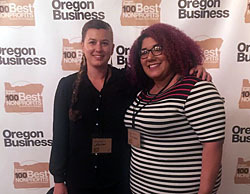 On September 29th, 100 nonprofits gathered at the Sentinel Hotel for Oregon Business Magazine's annual announcement of the 100 Best Nonprofits to Work for in Oregon. For the third consecutive year IHI is honored to be named one of the top 100. Categorized by large, medium, and small nonprofits, IHI ranked #13 in the small nonprofit category, up 10 spots from last year. The list relies on employee surveys rating their satisfaction with work environment, mission and goals, career development and learning, benefits and compensation, and management and communications. 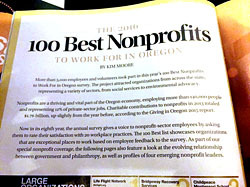 Here is a list of the 2016 100 Best Nonprofits to Work for in Oregon. On Thursday, September 8, Innovative Housing, Inc. (IHI) hosted a neighborhood block party at the Bridgeview Apartments and unveiled a new community chalkboard. At the block party, neighbors helped decorate tiles that will border the chalkboard and help "frame" its community conversation. "We wanted to initiate a community building activity that would encourage everyone in the neighborhood to participate and help strengthen the connection between the Bridgeview Apartments and the rest of the community. We found information about a chalkboard project that was very successful in San Francisco and thought we might be able to replicate that success here. We envision this as an evolving community expression piece created by anyone who walks by, picks up a piece of chalk, and shares something personal in public space" says Sarah Stevenson, Executive Director of IHI. "We really hope the community embraces it and makes it their own." Candy Chang, an artist from New Orleans, created a community chalkboard spanning the length of an abandoned house in 2011 allowing passersby to fill in the blank after the words "Before I Die..." Within one day the entire chalkboard was covered and soon she started to receive national and global attention and requests to duplicate the project. Now over 1,000 similar chalkboards have been built throughout the world. Candy says, "Our shared spaces can better reflect what matters to us as individuals and a community. With more ways to share our hopes, fears and stories. The people around us can not only help us make better places. They can help us lead better lives." 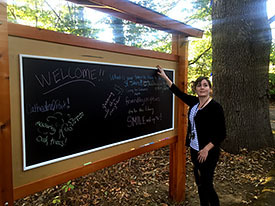 The new chalkboard is located on public green space at the entry to the Bridgeview Apartments, 5816 N. Trumbull Street. Everyone is invited and encouraged to engage! You can pose a question, respond to a question or comment, share a spontaneous thought or a well designed dream, or compose a poem inspired by surrounding oak trees and picturesque view of the St. Johns Bridge. 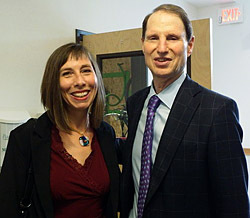 IHI was honored to host United States Senators Ron Wyden (D-OR) and Maria Cantwell (D-WA) at the Magnolia Apartments in NE Portland this week. 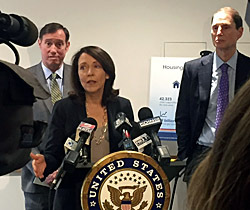 The Senators were in Portland to raise support for the Affordable Housing Credit Improvement act of 2016, which Senators Maria Cantwell and Orrin Hatch (R-UT) introduced on July 14 and which Senate Finance Committee Ranking Member Ron Wyden is co-sponsoring. This critical piece of federal legislation includes comprehensive reforms to the Low Income Housing Tax Credit (LIHTC) that will enable it to better serve extremely low-income and homeless families and rural and Native American communities. The federal Low Income Housing Tax Credit (LIHTC) is the single biggest source of development financing for affordable housing in our country. Increasing this critical resource and its flexibility is a great first step in a federal response to our national housing crisis. Thank you to Senators Wyden, Cantwell, and Hatch for your leadership and your commitment to helping people at all income levels obtain a safe, affordable home! 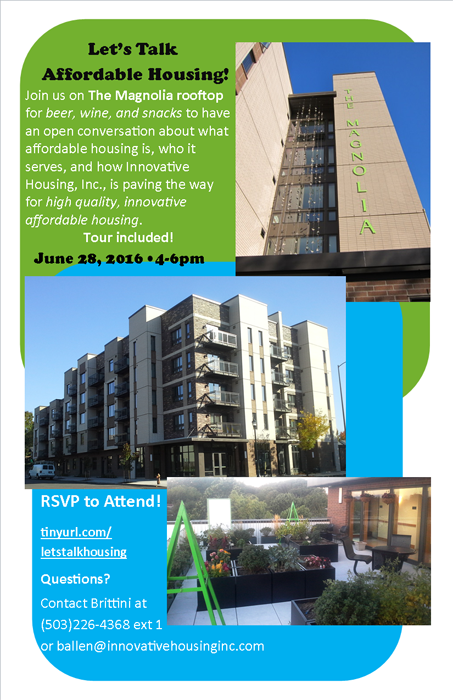 On June 28, 2016 IHI will host our first ever afternoon Happy Hour on The Magnolia Apartments rooftop to talk about what affordable housing is and how IHI is working to help solve the problem in Portland. We invite the public to join us for afternoon drinks, snacks, and conversation. The event is free to the public but you must register to attend as space is limited. Over the last two years IHI has joined other housers and service providers to form a Healthcare and Housing learning collaborative convened by Enterprise Community Partners. Enterprise retained Providence's Center for Outcomes Research and Education (CORE) team to conduct a study that explores the intersection between housing and healthcare, using housing operated by members of the learning collaborative. CORE and Enterprise released these long-awaited study results last week, providing concrete data that shows "affordable housing paired with health care services significantly increases access to primary care and reduces emergency department visits while lowering Medicaid costs." You can learn more about the report here. 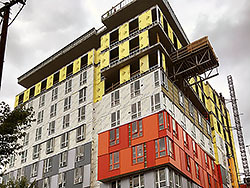 IHI and Bremik Construction invite you to submit a proposal for design-build plumbing, fire sprinkler, HVAC, electrical power-wiring and low voltage systems for the construction of a 12 story, 93 unit, 96,000 square foot apartment building. This project will follow Earth Advantage Gold Certification requirements. BOLI Prevailing wage rates are a requirement. EEO certification is required for subcontractors doing business in excess of $2,500. This project shall achieve DBE, WBE, MBE & ESB subcontractor minimum utilization rates of 30%. For more information, please view this document. We asked some of our young residents to share their favorite holiday memories - here they are! On November 13, 2015 Innovative Housing was honored to receive a 2015 Art DeMuro Award for its historic restoration and repurposing of the Erickson Saloon and Fritz Hotel Buildings. 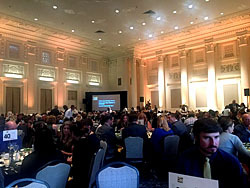 The DeMuro Award is bestowed by Restore Oregon to recognize extraordinary historic rehabilitation projects throughout the State. Innovative Housing, along with its development team of LRS Architects, Orangewall Studios Planning + Architecture, Silco Commercial Construction, and Froelich Engineers paid special attention to preserving historic pieces of the building, such as the original wood floors, ornate cornices, and original beams and studs, while converting the vacant commercial buildings into 62 apartment homes. 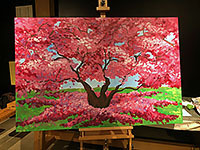 Beginning November 5, 2015, the Erickson Gallery will host a First Thursday event open to the public at The Erickson Fritz Apartments. 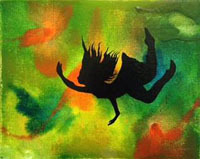 We will be featuring local artists each month for First Thursday exhibits at this new gallery space. Public art installations created by James Harrison, Evan Holt, Dave Laubenthal, and Natalie Ball will also be available for viewing in the Erickson Courtyard. 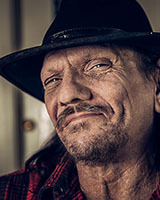 Joe Watts has lived in the Portland area the majority of his life. Joe started with oil painting and writing in the 80's and added photography to his portfolio in 2009. 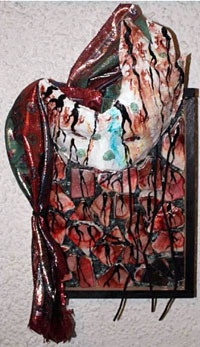 He works in many mediums including paper-casting, tile painting, watercolor and ink painting, photography, assemblage, sculptures, and writing. 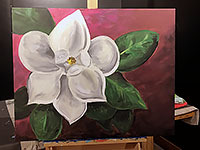 Joe says his, "eclectic style of different works makes life interesting and gives me the willingness to try anything... Art gives me life and the purpose to live each day to the fullest." 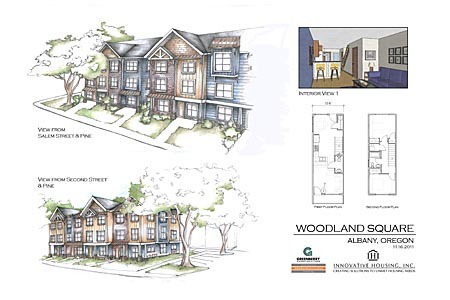 Innovative Housing is thrilled to announce that the City of Portland has selected IHI to develop new affordable housing at NW 14th and Raleigh in the Pearl Neighborhood. At least half of the units will house families who are homeless or at risk of homelessness and IHI will provide wraparound resident services to ensure that each family has the support necessary to use this new housing as a foundation for success. IHI's will work with a design team comprised of Alex Salazar (SalazArchitect) and LRS Architects and Bremik Construction will be the general contractor. IHI's strong track record of finishing projects on time and on budget, along with our demonstrated commitment to equity contracting and high quality development, gave IHI the edge in a very competitive application process. We are thrilled to be working with an outstanding team and look forward to partnering with the Portland Housing Bureau to create new affordable homes in a great, family-friendly neighborhood. We have free screening tickets to see 99 Homes! 99 Homes is a dark thrilling tale about a father who is trying to care for his mother and child after being evicted from their home. Check out the trailer below and click http://bit.ly/1ObhMLK to get your tickets to the free screening on Tuesday, October 6th at Pioneer Place at 7pm. This movie looks amazing. Please feel to share this with your friends. On July 23rd, 2015 IHI celebrated the completion of a $15.9 million restoration of the historic Erickson Saloon and Fritz Hotel Buildings and the creation of 62 new apartment homes. To mark the occasion, the Erickson Fritz Apartments hosted a progressive party where guests enjoyed diverse culinary offerings from local Old Town restaurants while touring newly constructed apartments, each set up to showcase one of Old Town's coolest and most exciting establishments. Party-goers also experienced the unveiling of specially commissioned art installations that explore the legacy of these storied buildings. IHI is proud to be one of the nonprofit housing developers showcased in a national report by Enterprise Community Partners: Successful Organizational Practices: Strong Partners, funded by JPMorgan Chase & Co. The report showcases 14 nonprofits, including Innovative Housing, and the practices and priorities these organizations follow to remain effective. Innovative Housing is featured in The National Trust for Historic Preservation's Fall 2014 Forum Journal and was recognized on October 18, 2014 at the Architectural Heritage Foundation's Riches of a City Event for its preservation work in Old Town. 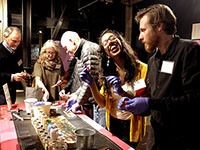 The National Trust for Historic Preservation highlighted IHI as a nonprofit that embraces historic rehabilitation as way to achieve its charitable mission. The Forum Journal features IHI's redevelopment of Musolf Manor and includes an interview with Executive Director Sarah Stevenson - you can read the full article here. 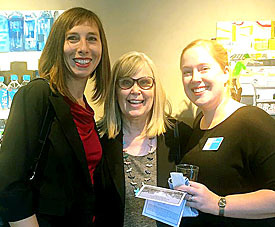 Locally, IHI was recognized at the Architectural Heritage Center's annual event for its contributions to historic preservation in Old Town/Chinatown. IHI's work in the neighborhood includes the historic rehabilitation of Musolf Manor, the Modern Rich Apartments, and the Erickson Saloon/Fritz Hotel buildings, which are currently underway. Click here to learn more about IHI's renovation of the Erickson and Fritz buildings. IHI launched its first individual donor campaign at our 30th Anniversary Celebration. At that event, many generous donors stepped up and formed the inaugural class of The Innovators, an elite group of individuals committed to helping low-income people use affordable housing as their foundation for success. The Innovators gave $3,670 at our Anniversary event, putting IHI well on its way to meeting our $10,000 goal by June 30, 2015! You are invited to IHI's 30th Anniversary Celebration! to toast 30 years of service. Innovative Housing, Inc.'s mission is to provide high-quality, affordable housing to individuals and families and services to help our residents maintain their housing, access opportunities, and break the cycle of poverty. IHI owns and operates 920 affordable rental units in the Portland Metro region, with two new projects currently underway. 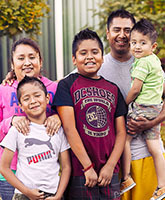 IHI houses over 2,400 children and adults each year. IHI dedicates more than half of our operating budget and staff time to supporting our residents and providing essential services that help them use their housing as a foundation for success in life. 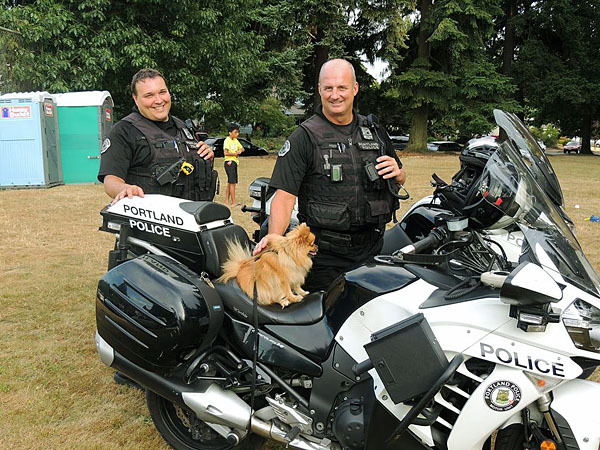 National Night Out (NNO) is a community event celebrated annually during the first week in August throughout the U.S. and Canada, with a focus on strengthening neighborhoods and preventing crime. 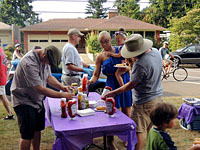 There are many different ways to celebrate the event--we are having a classic BBQ in the park! IHI's 2014 FriendRaiser at the Erickson Saloon! Family Housing in Albany Fully Funded! In November, 2013 Oregon's Department of Housing and Community Services awarded $8.3 Million worth of tax credits and grant funds to complete capital funding for IHI's redevelopment of the Woodland Square Mobile Home Park. Almost exactly two years after the Central Albany Revitalization Area (CARA) Advisory Board awarded $1.45 Million for the project, the State stepped in with resources that will enable IHI to turn a dilapidated trailer park into high-quality, affordable homes for working individuals and families. Innovative Housing will create 54 new apartments on the site, including accessible flats and townhouse style family apartments. In addition, IHI will restore the Periwinkle Creek canyon that runs along one edge of the property. IHI has also committed to spending 15% of total project costs on local contractors and suppliers, directly benefiting Albany's local economy. IHI's development team includes Greg Goracke and Greenberry Construction as general contractor and Bill Ryals and Gary Hartill of ORANGEWALLStudios Architecture + Planning as architects for this exciting and catalytic new project. Thanks to our 2013 Coats for Kids Donors! Eight years ago, IHI received a phone call from a resident who was concerned that her neighbor's children were walking to school in cold winter weather without coats. IHI inquired and learned that the family could not afford coats for their children. That was the beginning of our Coats for Kids Campaign and we are proud that no child living at an IHI property has since gone without a winter coat. 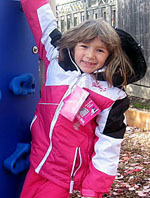 Click here to view a photo collage of children enjoying their new winter coats! 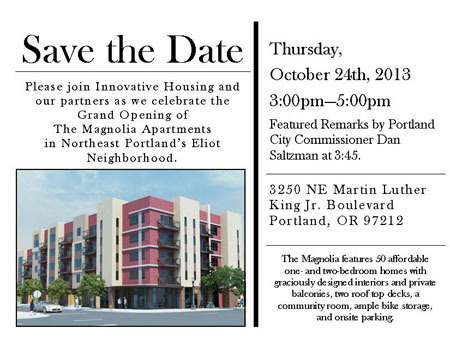 Please join Innovative Housing and our partners as we celebrate the Grand Opening of The Magnolia Apartments in Northeast Portland's Eliot Neighborhood. Featured Remarks by Portland City Commissioner Dan Saltzman at 3:45. The Magnolia features 50 affordable one- and two-bedroom homes with graciously designed interiors and private balconies, two roof top decks, a community room, ample bike storage, and onsite parking. IHI Celebrates National Night Out! 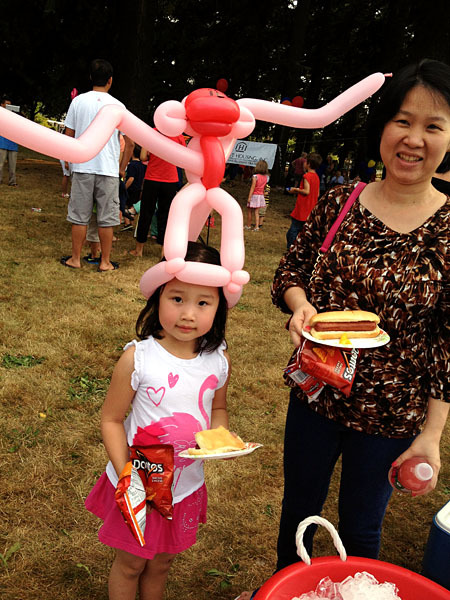 On August 7, 2013 Innovative Housing teamed up with the Jason Lee SUN School and Income Property Management to host a National Night Out party for the Madison South Neighborhood in Northeast Portland. The community really turned out for this event - over 200 people participated! 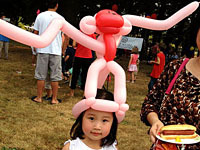 Families and individuals of all ages mingled, met their neighbors, and enjoyed free hot dogs, expert face painting, a cake walk, and badminton in Hancock Park. 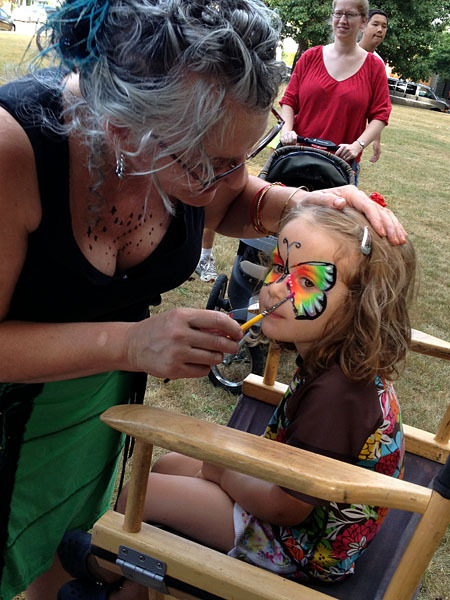 IHI would like to thank Income Property Management for sending volunteers and donating a talented face painter from Glitter Ruby Face Painting, Rosie's Room for hosting the craft table, and Dylan Gelinas from Slightly Twisted Balloons for providing amazing balloon creations. We look forward to another great party next year! Thanks to Walsh Construction Co. and Their Generous Golf Tournament Sponsors! IHI extends its sincere thanks to Walsh Construction Co. for including IHI as a charity beneficiary of its 2013 Walsh for Housing Golf Tournament. It was a fun and sunny event that raised money to support Innovative Housing, Lifeworks NW, and the Union Labor Retirement Association. Thanks to everyone at Walsh who worked hard to put the event together and thanks to all of the tournament sponsors who made the event a success! Now Accepting Applications for The Magnolia! IHI is pleased to announce that lease up has begun at our newest housing development in Northeast Portland! 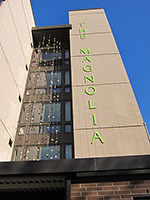 The Magnolia is a 50 unit apartment complex on Martin Luther King Jr. Boulevard. It offers one and two-bedroom apartments at affordable rents - Income Property Management is accepting rental applications. Please contact the Magnolia manager at (503) 282-1005 for more information. Please read all materials before submitting your application. We look forward to welcoming you home to The Magnolia! Historic rehabs are exciting and fun to watch, especially if you have a chance to see the properties before construction begins. IHI is offering our friends a special opportunity to tour the Erickson and Fritz Buildings now, so you can see the "before" and "after" for yourselves. Tours will also include a look at the Modern Rich Apartments, to give you a sneak preview of the improvements we plan to make. 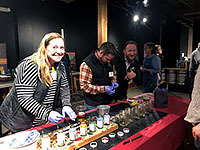 Tours are free but space is limited -- please contact Katie at (503) 226-4368, x1, to reserve your spot! Innovative Housing is very pleased to announce that we will be bringing more mixed-income housing to the Old Town neighborhood! IHI's vision for a vibrant, mixed income community in the heart of downtown Portland moved one step closer to reality this month when the Portland Housing Bureau awarded funding to develop 62 new units of housing on the site. Just steps away from the Modern Rich Apartments, which IHI completed in September 2012, the historic Erickson Building sits vacant, waiting to be transformed. Adjoined in the middle of the block with the Fritz Building, both buildings are empty with largely unfinished interiors. This provides IHI a great opportunity to build "new" housing units with full seismic upgrades and all the amenities of modern construction while preserving the historic exteriors of these two buildings. IHI's development team and architects are planning a project similar in design to what we did at the Modern Rich Apartments - we will punch existing light wells through to the ground floor and daylight the historic atrium to create four interior courtyards. The courtyards allow us to maximize limited building space and create 62 studio and one-bedroom units that will house people with a complete range of incomes. Most of the units will house working people who want to live near jobs and schools. With the influx of new employers and educational institutions in Old Town, there is significant pent up demand for housing in the neighborhood. A handful of the apartments will be affordable to people with very low incomes, and 10 units will have no income limits at all. IHI's goal is to create a truly mixed-income development that will contribute to the revitalization of Old Town and provide affordable housing options for people who want to live in downtown Portland. The City of Portland's investment in Old Town and its critical support of this housing development enable IHI to move forward and seek additional capital sources from the State. We hope to have all project funding in place by the end of 2013, start construction in 2014, and have 62 new homes ready for residents by 2015! 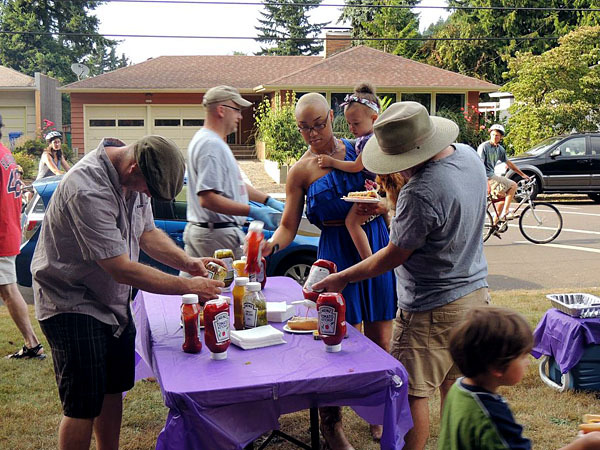 On January 7, 2013 IHI submitted a proposal to the Portland Housing Bureau requesting $2 Million to develop Phase 2 of our Eliot Neighborhood Housing. IHI owns a half block fronting Martin Luther King Jr. Blvd. and is currently building 50 units on one half of the site (check out our website to see this development in process). We are proposing to add 47 more units on the remaining land, including larger units for families. Our architects have designed a 4-story building with an interior courtyard and an indoor/outdoor playroom for children. The property is very close to Irving Park, but we want someplace for kids to play when the weather is too cold and rainy for the park. Phase 2 will be closely integrated with Phase 1 so we can achieve operating efficiencies and create a truly mixed-use community that includes commercial space and studio, one, two, and three-bedroom apartments that will house singles, couples, and families in this fantastic Northeast Portland neighborhood. We should hear back from the City in early March. If they approve our request, IHI will apply to the State for federal low-income housing tax credits to complete our capital funding. Fingers crossed that more high-quality, affordable housing will soon be coming to the Eliot Neighborhood! This year, give a gift that embodies the spirit of the season and make a donation to Innovative Housing on behalf of someone special. It is tax deductible for you, and is certain to be a perfect fit for your recipient! You can do it all online from the comfort of your own computer. Just go to the Donate Now button on the left side of our website and make a donation. Download a gift certificate that you can present to your recipient. If you prefer to mail us a donation, please indicate that it is intended to be a gift and we will send you a gift certificate along with a receipt for your donation. IHI closed the acquisition and construction financing for our new Eliot Neighborhood Housing in September and got right to work! Construction crews worked on a tight schedule in September and October to get footings and foundations poured before the rains began. This exciting new project will create 50 affordable homes in a great Northeast Portland neighborhood. Please visit our website to learn more and view photos of our construction in progress! IHI has committed to achieving a 30% utilization rate for Minority and Women Owned Businesses on this development. Our team includes Walsh Construction and Faison Construction as general contractors and Carleton Hart Architects, P.C.. 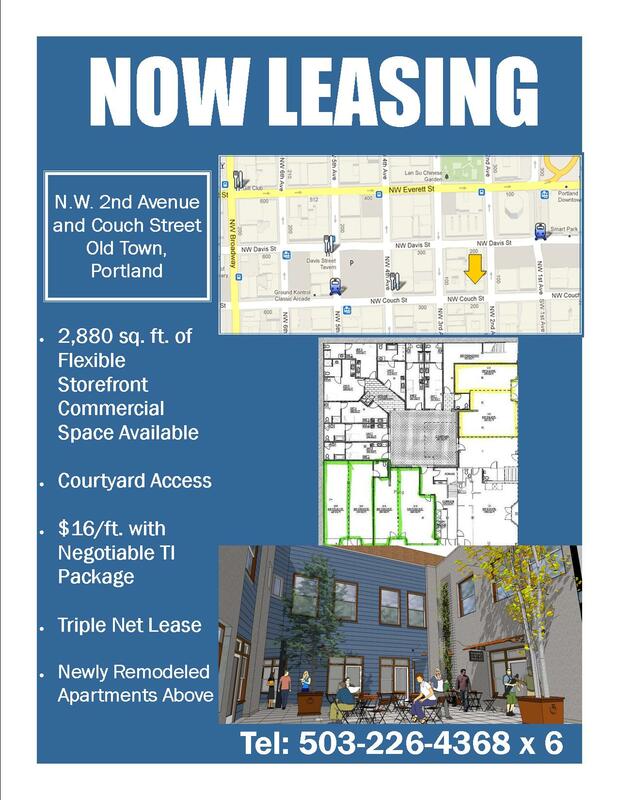 Between the completion of the Modern Rich Apartments in Old Town and starting construction on our newest project in Northeast Portland, IHI has been in the news a lot lately. Check it out! View a video of KOIN TV's story about the Modern Rich Apartments that aired on Tuesday, September 18, 2012: Click to view the video. Read an article about the opening of the Modern Rich Apartments in the September 20, 2012 Portland Business Journal: Click to view the article. Read the Daily Journal of Commerce's October 1, 2012 front page article about IHI's newest housing development on Martin Luther King Jr. Boulevard: Click to view the PDF. The same DJC issue highlighted IHI's remodel of the Village Square Apartments in their Renovation Roundup: Click to view the PDF. IHI staff recently asked some of our younger residents why they liked living in their homes. Click on the link below to hear what they had to say. 2012 Construction Kick-Off & FriendRaiser a Tremendous Success! On Saturday, July 21st friends, families, and neighbors joined Innovative Housing at the site of its newest housing development for a day of sun, sand, and salsa music. Children "drove" real diggers, dug in a sand pit, enjoyed construction-themed craft activities, got their faces painted, and visited with firefighters. Neighbors were able to learn more about IHI's upcoming project and participate in a naming contest for the new apartments. And everyone enjoyed delicious Columbian food provided by Hacienda CDC's Micro Mercantes Program, free popcorn, cookies, and drinks. View a slideshow of the event. Thanks to IHI's generous sponsors, IHI's first FriendRaiser was also our most successful fundraising event to date! Sponsor donations will support IHI's Resident Services Program, which helps our residents maintain their housing stability, improve their quality of life, and access opportunities to break the cycle of poverty. 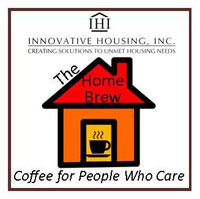 To learn more about IHI's services, please visit our website at http://www.innovativehousinginc.com/services/services.html. IHI's renovation of The Rich Building is moving quickly and we are ready to start preleasing the apartments and commercial space! We are seeking a restauranteur for our premium corner space that will create a destination eatery and also serve the influx of new residents and students coming into Old Town. 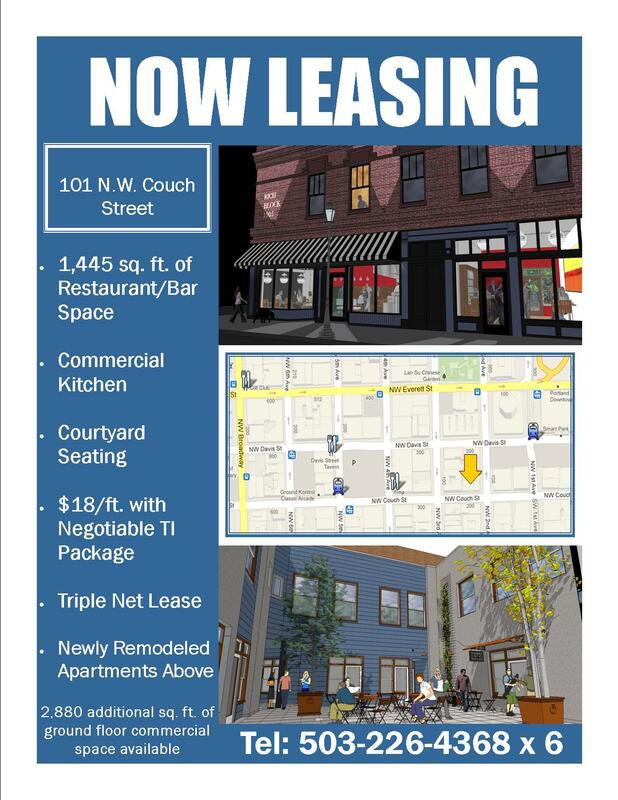 1,445 square feet of streetfront space, a commercial kitchen, and courtyard seating make this a great opportunity! Click here for leasing information on the restaurant space. In addition to the restaurant space, there are 2,880 additional square feet of flexible storefront commercial space available. Get in the ground floor (literally!) and tell us how much space you need. Click here for leasing information on the commercial space. 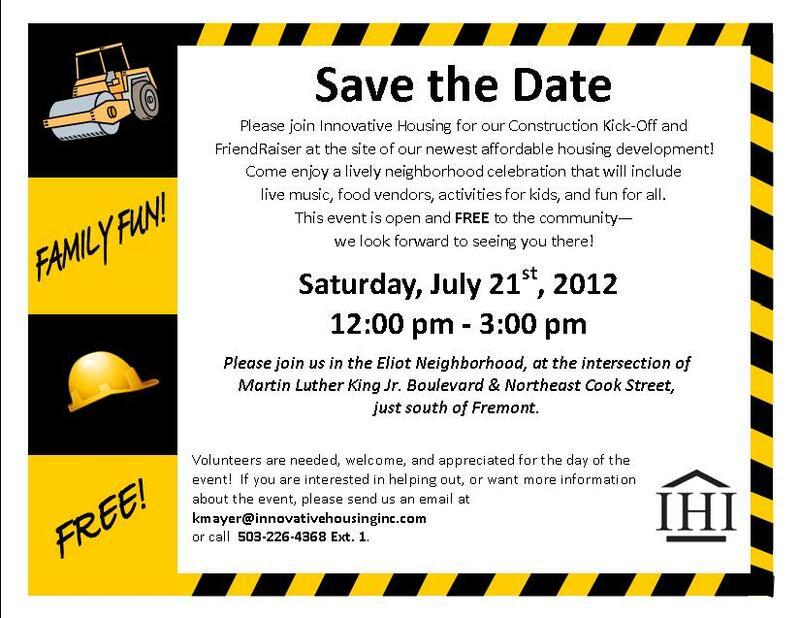 Save the Date for IHI's Construction Kick-Off and FriendRaiser! Eliot Neighborhood, at the intersection of Martin Luther King Jr. Boulevard & Northeast Cook Street, just south of Fremont. On March 22, 2012 IHI closed on $1.8 Million of construction financing with Wells Fargo and began interior demolition of the historic Rich Building in Old Town, Portland. IHI is combining 42 single room occupancy ("SRO") units on the second floor to create 26 studio apartments and gutting and reconstructing the ground floor to create 8 additional studio apartments, a fully enclosed courtyard, and 4-5 reconfigured storefront retail spaces. At the end of the day, The Rich will bring 34 workforce studio apartments and revitalized commercial space to the Old Town/Chinatown neighborhood. Visit The Rich Building page for demolition and construction in progress photos! IHI's development team includes Silco Construction as general contractor and ORANGEWALLStudios Architecture + Planning as architects for this exciting new project. On November 16, 2011 the Central Albany Revitalization Area (CARA) Advisory Board voted unanimously to award $1.45 Million of urban renewal funds for Innovative Housing's redevelopment of the Woodland Square trailer park. The trailer park is located on a gateway parcel along Old Salem Road and has long been identified by neighbors and CARA as a blighted site in need of improvement. Innovative Housing is proposing to develop 54 new units of affordable housing for working individuals and families, including accessible flats and townhouse style family apartments. IHI's development team includes Greg Goracke and Greenberry Construction as general contractor and Bill Ryals and Gary Hartill of ORANGEWALLStudios Architecture + Planning as architects for this exciting and catalytic new project. Read more about the project and view a rendering in this recent feature story in the Daily Journal of Commerce. With this substantial local funding commitment, IHI will now submit an application to Oregon Housing and Community Services for grants and federal low-income housing tax credits to complete development sources for this $10.6 Million project. The Design Develop Construct (DDC) Journal is an international publication focused on North America's building and real estate industries. The DDC dedicated a portion of its Fall 2011 issue to affordable housing, highlighting outstanding organizations that work in this field from throughout the United States. Innovative Housing is proud to be included in this publication, and to be the only organization selected from the Northwest region. Read IHI's profile in the DDC. Innovative Housing has property in Albany, Oregon under contract and is exploring a development that will create 54 new units of family housing. IHI is proposing to redevelop the Woodland Square mobile home park at 2nd, Pine, and N. Salem Avenue into high quality, attractive new apartment homes. Our goal is for this new housing to be affordable to working families in Albany, and for the apartment homes to be an asset in the neighborhood to help encourage additional redevelopment in the area. Read more about our proposed project in this recent Albany Democrat-Herald article. Last winter IHI submitted a proposal to the Central Albany Revitalization Agency (CARA) to complete an historic renovation of the St. Francis Hotel. IHI's proposed renovation of the 100-year-old building would have included a full seismic upgrade, restoration of the historic façade, and creation of 42 affordable residential units. CARA did not fund IHI's proposal so that project did not proceed, but IHI is still excited about partnering with CARA and the City of Albany to create affordable housing for this vibrant city. Innovative Housing is thrilled to announce that Oregon Housing and Community Services has awarded $400,000 of grant funds and an allocation of $820,000 in Low Income Housing Tax Credits to complete the funding process for Eliot MLK. IHI can now aggressively move into design development and prepare to break ground on this exciting new project in the summer of 2012. Eliot MLK, as it is currently called, will provide 49 new affordable rental homes in Northeast Portland. 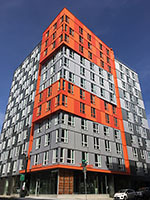 The Portland Housing Bureau awarded IHI $975,000 through a competitive application process in February 2011. The State funding award represents approximately $7.9 Million of capital and puts this development on the fast track with the goal of being complete by summer 2013. Eliot MLK is an exciting transit-oriented development on Martin Luther King Jr. Boulevard, just south of Fremont. The area has excellent transit with a high frequency bus line, access to Irving Park just one block away, services and amenities along MLK, and is close to downtown Portland. The project will seek LEED certification and include many green elements to minimize operating costs for residents and IHI. Read more about the project at http://www.innovativehousinginc.com/housing/magnolia.html. The First Annual Walsh for Housing Golf Tournament was a smashing success! Everyone had a great time, the sun decided to shine, and over $45,000 was raised to support affordable housing. IHI staffed Hole 11 and facilitated a marshmallow driving contest (yes - the marshmallows did have IHI's logo on them!) while educating players about IHI's housing, resident services, and employee giving programs. Congratulations to Paul Potter for winning the marshmallow driving contest! The highlight of the day came just as everyone sat down for a delicious lunch in the Big Red Barn - a helicopter circled the course and dropped 700 golf balls from above. 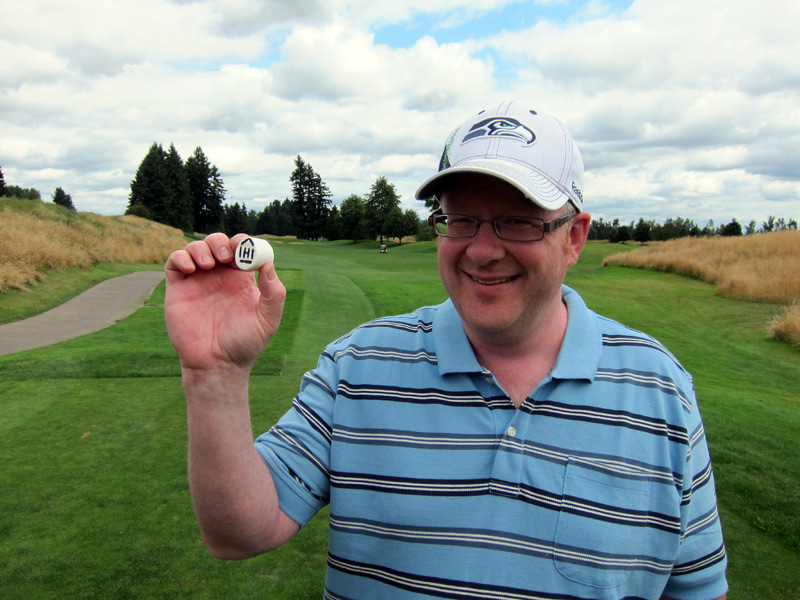 Raffle tickets sold ahead of time corresponded to numbers on the balls and the ball closest to the 18th hole won $1,800! A hearty thanks to Walsh for organizing such an outstanding event and to all of the sponsors for their support of IHI and our mission! Innovative Changes Receives $290,000 from the CDFI Fund! Innovative Changes has been awarded $290,000 to help Oregonians gain household stability and avoid predatory lending options. This is fantastic news for Innovative Changes and will allow IC$ to expand its program to serve even more households throughout Oregon. Read the full press release. IHI created Innovative Changes in 2010 to help low-income people with immediate cash needs access funds and financial education. Learn more about IHI and Innovative Changes. In place of IHI's annual golf tournament, this year IHI will participate in the first Walsh for Housing Golf Tournament. The Walsh tournament will feature a full field of 30 teams and be held at Langdon Farms Golf Club on Tuesday, July 26th. Proceeds from the event will benefit Innovative Housing, Central City Concern, Northwest Housing Alternatives, and REACH CDC. It is a great way to enjoy a beautiful golf course on a sunny summer day and support affordable housing, all at the same time! This June elementary and middle-school children from Broadway Vantage Apartments unveiled their first art exhibit as a celebration of their participation in Innovative Expressions. IHI offers this year-long empowerment program to strengthen young voices, using art and storytelling as a mode of self-expression. Through the lens of a camera or the brush strokes of their latest self-portrait, youth share stories of family, school and community. Read more about it at Oregonlive.com. Innovative Expressions is part of Innovative Futures, IHI's comprehensive family and youth service program. Read more about Innovative Futures. Innovative Housing's rehabilitation of The Clifford Apartments was selected as the First Place Winner in the $1-$5 Million Renovation category at the Daily Journal of Commerce's TopProjects 2011. Announced on May 26th, this award caps the successful completion of IHI's historic renovation of the 100-year-old Clifford Hotel. IHI proudly shares this honor with Walsh Construction, Co., General Contractor; Carleton Hart Architecture PC, Architect; and Roggenkamp, Erickson, and Associates, Structural Engineer. DJC's TopProjects is the premier building and construction award program in the region. Founded in 1872, the Daily Journal of Commerce (DJC) provides comprehensive resources and reporting on the Portland, Oregon building and construction market. Because it is the official newspaper of the City of Portland, DJC is a primary source of public notice information, including call for bid notices. The DJC daily newspaper and website also report industry developments such as construction news, real estate, development, urban planning, energy, and transportation news. IHI is very pleased to be recognized by the DJC - read more about The Clifford's award. Congratulations to Savana Semallie for Her Award Winning Poster! 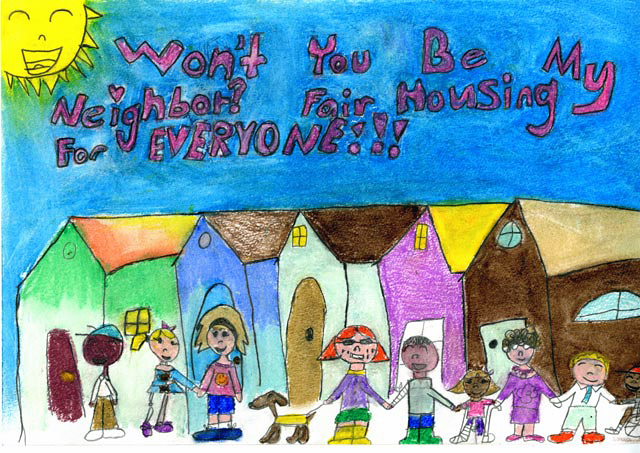 Innovative Housing congratulates Savana Semallie, an IHI resident and third place winner of the Fair Housing Council of Oregon's annual Fair Housing Poster Contest. Savana's submission won third place for grades 1-3 - great work Savana! Read more about the poster contest and view all the winning entries at: http://www.fhco.org/contest.htm. Innovative Housing is pleased to announce it has been awarded funding to build 49 new affordable rental homes in Northeast Portland. The Portland Housing Bureau awarded IHI $975,000 through a competitive application process. IHI will apply to the State for additional funds in April and, if awarded, plans to break ground in the summer of 2012. This exciting transit-oriented development is well located on Martin Luther King Jr. Boulevard. The area has excellent transit with a high frequency bus line, access to Irving Park just one block away, services and amenities along MLK, and is close to downtown Portland. The project will include commercial space on MLK and many green elements to minimize operating costs for residents and IHI. Some unique green features include corridors open to the outdoors that daylight at each end, fresh air that comes in behind the refrigerator to warm up before entering the unit, and on-site urban composting. IHI plans to submeter water/sewer so that residents pay for and control their own usage, and will provide education and information about water conservation. An outdoor plaza will provide space for community gatherings and help neighbors get to know each other. Inside the building, every unit will have a balcony, dishwasher, washer/dryers, 24 hour fan, polished concrete or wood laminate flooring, energy efficient Comfort Cove heating, and ceiling fans. Interior plans will focus on livable, open spaces with warm colors, wood trim, hardwood cabinets and extra storage in the kitchens. IHI looks forward to working with neighbors to finalize a design that will both enhance the urban fabric of the MLK corridor and be sensitive to residential neighbors. The initial plan includes stepping down the building to lower its impact on single family homes, with landscaping, building color and architectural details to help integrate the property into the neighborhood. Along MLK, IHI envisions the storefront and lobby entrance areas with large glass window walls, a generous canopy, attractive lighting and eye-catching signage. For residential street fronts, the concept includes front entries for each apartment that feature energy efficient entry lighting, attractive landscaping, and front porches that both welcome and strengthen pedestrian connections. Read more about our new Eliot Neighborhood development. Innovative Housing is proposing to completely rehabilitate the former St. Francis Hotel in downtown Albany, Oregon. IHI's proposed renovation of this 100-year-old building includes new systems, a full seismic upgrade, and restoration of the historic façade. The interior of the building will include lobby, offices, commercial space, laundry room, bike room, and 42 residential units. IHI has requested $800,000 from the Central Albany Revitalization Area; total project cost will be approximately $10 million. IHI plans to retain and enhance the extensive existing historic fabric on the interior of the building, including tin ceilings, mosaic tile flooring and wood wainscotting in the lobby, fir floors, stained wood casing, trim and original doors. Updates will include modern bathrooms and quality kitchens with hardwood cabinets, dishwashers, ranges and refrigerators. In addition to preserving a historic treasure, IHI's renovation will create 42 elegant, affordable housing units and bring new residents into Albany's downtown district. The project will leverage millions of dollars of investment in Albany and help stimulate the City's downtown development efforts. Read more about our proposed project in this recent Albany Democrat-Herald article and editorial. IHI recently completed the historic rehabilitation of The Clifford Apartments, preserving 88 units of affordable housing, and completed a $15 million historic renovation and seismic upgrade of Lyndon Musolf Manor in 2009. UPDATE: IHI worked with the owners of the St. Francis, the City of Albany, and the Central Albany Revitalization Agency (CARA) to refine our project proposal for more than two months. Unfortunately, on February 16, 2011, CARA voted against awarding IHI $800,000 for the renovation of this historic hotel. Objections to the proposed development centered on concerns around parking and IHI's use of the site for affordable housing. Without local funding support, IHI will not be pursuing this project. In 2009 and 2010 IHI closed on $8.1 million worth of construction and permanent loans, acquiring, renovating, and/or refinancing four affordable multifamily properties. Two publications released in January 2011 by the Center for Housing Policy summarize findings from recent research about how affordable housing creates jobs and spurs local economic development. Create jobs. Investing in the development of affordable housing creates a significant number of construction-related jobs, and new residents support additional jobs in other sectors going forward. Attract both employers and employees. Surveys and supporting research show that both employers and workers understand the importance of affordable housing in attracting and retaining a skilled workforce. Increase consumer spending. Building affordable housing increases the buying power of both those involved in its construction and those who occupy it afterward. Read more in The Role of Affordable Housing in Creating Jobs and Stimulating Local Economic Development: Evidence in Brief and its companion A Review of the Literature. The Perfect Gift for Any Season! Make a donation to Innovative Housing as a gift to someone special. It is tax deductible for you, and is certain to be a perfect fit for your recipient! IHI is proud to announce that The Clifford Apartments' historic rehab is complete. Started in March 2010, this renovation restored historic elements of the building, created community space, and improved residential units. IHI also made seismic and energy efficiency improvements that will make the building safer and reduce operating costs. IHI's acquisition of The Clifford Apartments preserved and improved 88 units of low-barrier, affordable housing. Most of the residential units are already leased, and IHI expects the remaining units to fill quickly. In the words of Bryan, a Clifford resident, "I love my new apartment here. Everything has been so positive. I am really able to get my feet on the ground here." The Clifford Apartments project was made possible by funding from the Portland Development Commission/Portland Housing Bureau, Oregon Housing and Community Services, the Federal Home Loan Bank of Seattle, Multnomah County, the City of Portland, Wells Fargo Bank, the Network for Oregon Affordable Housing, and an equity investment by the Historic Preservation Fund. Our development team included Walsh Construction Co. and Carleton Hart Architecture. A Grand Re-Opening and 100th Birthday Celebration is scheduled for January 26, 2011. Please join us! There is one 400 square foot commercial space available for lease that fronts on SE Morrison Street. Interested parties should contact IHI directly for leasing information. IHI is excited to announce a new partnership with the Multnomah County Library to implement an early literacy program at our family properties! The development of language and literacy skills begins at birth and children develop much of their capacity for learning in the first three years of life... long before kindergarten. The Multnomah County Library's Early Childhood Services Department is going to train IHI resident service staff to educate parents about how easily they can help their young children develop critical language and reading skills. The Library is going to supply IHI with early literacy books for children ages 0-2 and 3-5 that families can exchange on a rotating basis and will conduct specific classes for residents at our housing sites. IHI and the Library will work together over the next six months to develop a customized package program that includes early literacy resources, a fun and easy curriculum for parents, regular classes for parents taught by library staff, and events for tots. Getting children started off on the right foot and supporting parents in the early years is a high priority for IHI. Thanks to the Multnomah County Library for its enthusiastic support of our new program! Coats for Kids Thank You! 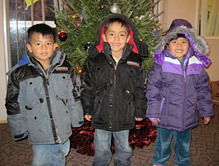 IHI extends a heartfelt thanks to all who contributed to our 5th annual Coats for Kids Campaign. Winter brings increased hardships for families struggling to make ends meet, as parents must stretch their budgets to pay higher utility bills and provide warm clothing for their children. 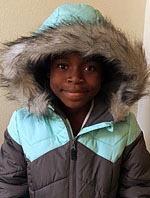 Because of your generosity, we were able to provide warm winter coats to low-income children living at IHI's family properties. We are also honored to be a recipient of donations through REI's Annual Holiday Coat Drive held in their Portland store. For over ten years, REI has generously hosted a coat drive to help individuals in our community. If you haven't yet made a donation and are interested in doing so, it's not too late! For information, please contact Angie Harbin, IHI's Director of Resident Services, at (503) 226-4368 ext. 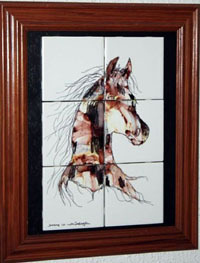 6 or by e-mail at aharbin@innovativehousinginc.com. Thank you! 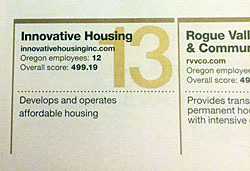 IHI One of Oregon's 100 Best! 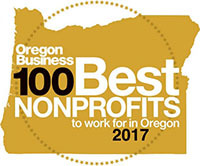 More than 150 nonprofits from around the state participated, and almost 5,000 employees completed a survey conducted by Oregon Business Magazine. The rankings were based on the confidential input of employees who answered 60 questions about workplace satisfaction such as benefits, management, trust, work environment and career development. Congratulations to IHI and its staff for fostering an outstanding workplace! 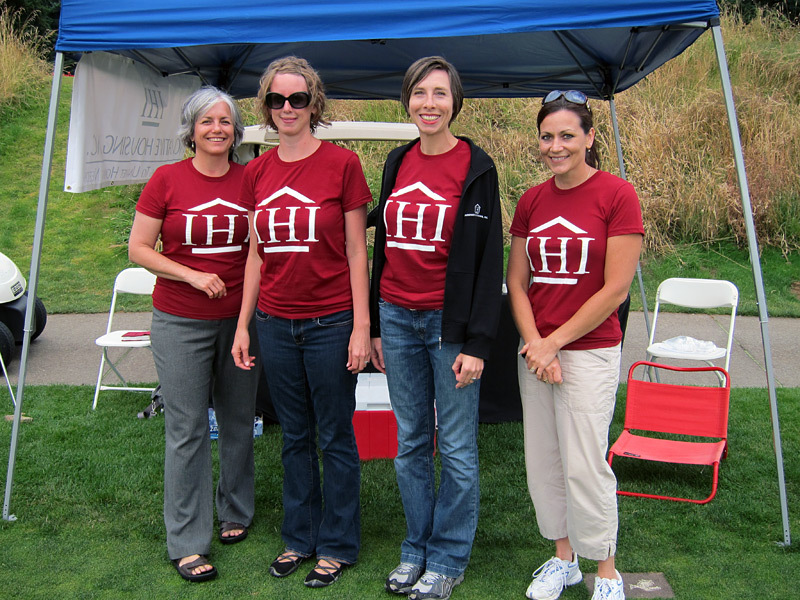 IHI's Second Annual Charity Golf Tournament was a big success! 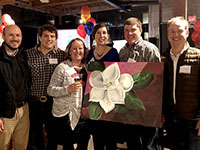 This year's event brought together 22 sponsors, 80 players, and numerous donors to raise more than $20,000 gross for IHI's Resident Services Program. The tournament was again held at Colwood National Golf Club. We extend a big thanks to Walsh Construction Co. who co-sponsored this year's event and to all those who participated and donated on behalf of IHI. We look forward to another fun tournament in Summer 2011! In June 2010, IHI completed the Hewitt Place Townhomes rehabilitation project. Using Oregon State American Recovery and Reinvestment Act Low Income Housing Tax Credit Exchange Program funds, City of Portland Community Development Block Grant Recovery funds, and construction and permanent loans from Key Bank, IHI selectively upgraded flooring with more durable materials and replaced kitchen cabinets and vanity cabinets. The project used low Volatile Organic Compound paint and installed Energy Star appliances and lighting fixtures. Windows, roofs, and siding were replaced, new equipment was installed at the three playgrounds, and each of the eleven buildings received a fresh coat of paint. The project replaced patio fences and added gates for security and privacy. Lawn space was reduced by 30% and replaced with native plants with an anticipated water use savings of 30-40%. The project also converted one of the two-story three-bedroom units into a ground floor community space and a second-floor one-bedroom unit. IHI is very excited to now have a community room at Hewitt Place. This room will provide a space for Resident Services office hours, services such as financial education and eviction prevention, and activities such as afterschool programming for youth. 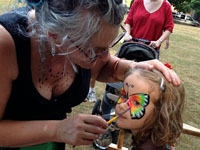 For the second consecutive summer, the Portland Children's Museum brought the joy of art beyond their walls... all the way to Gresham and Troutdale. The Museum's Community Partners Bread and Art Program complemented Innovative Housing's annual summer lunch program by bringing inspiration, creativity and the wonder of learning to the places children live. 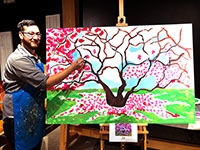 The goal of this program is to encourage children to communicate their ideas and stories and facilitate long-lasting connections between the arts and the communities that the Portland Children's Museum serves. Over 40 children worked on bi-weekly art projects with Museum staff. At the end of the summer, participants and their friends and family attended a special night at the Museum in which they were able to enjoy the Children's Museum- many for the first time. 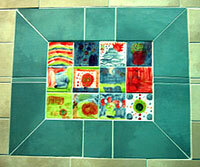 Last year's participants were thrilled to see the tiles they made the previous summer in a new way. They now decorate the Museum's water room as a permanent display! IHI is pleased to announce the launch of Innovative Change$, an emerging Community Development Financial Institution. Innovative Change$ (IC$) helps low- and moderate- income individuals and families manage short‐term financial needs in order to achieve household and financial stability. IHI received funding from Meyer Memorial Trust, Northwest Health Foundation, and Spirit Mountain Community Fund to initiate the pilot phase of IC$. After receiving its state lending licenses, IC$ officially opened for business in February 2010, providing financial education, resource mapping, credit-building opportunities, and small-dollar, short-term consumer loans. Throughout the pilot phase, IC$ lending services will be available to clients, including Innovative Housing's residents, on a referral-only basis, through one of IC$'s partner organizations. Financial education services -- including individual coaching, group workshops, and special seminars -- are available to the public and are free of cost for a limited time. Please visit the Innovative Change$ website or call the IC$ staff at (503) 943-5607 for more information about how to participate.